The GroupWise Installation program includes an Installation Advisor to help you install the GroupWise files to the appropriate locations and a Setup Advisor to help you create and configure your GroupWise system. Both Advisors provide information to guide you through the process. If you are comfortable with your knowledge of GroupWise, you can skip this planning section and continue with Section 3.3, Setting Up a Basic GroupWise System. Otherwise, you should review the following sections while filling out Section 3.5, Basic GroupWise System Worksheet. The worksheet lists all the information you are prompted for as you run the Advisors. To help with the above tasks, you can also review the GroupWise Wiki, which includes a Best Practices section. IMPORTANT:If you plan to install GroupWise in a clustered server environment, refer to the GroupWise 7 Interoperability Guide as you plan your GroupWise system. The Installation Advisor prompts you for information about the Novell eDirectory™ tree where you plan to create GroupWise objects and the network server locations where you plan to create GroupWise directories and install files. The following sections prepare you to supply the required information. GroupWise is administered through eDirectory, the directory service provided by Novell. All components, such as domains, post offices, libraries, and agents, as well as all users’ GroupWise accounts, are configured through objects in eDirectory. You need to make sure that you have eDirectory installed in your environment. eDirectory can be installed on NetWare, Linux, or Windows. GroupWise 7 includes the Novell eDirectory CD to assist those who do not already have eDirectory installed and want to install it on Linux. Follow the instructions in the Novell eDirectory Installation Guide to install eDirectory, along with its latest Support Pack, and ConsoleOne® before proceeding to install your basic GroupWise system. The Setup Advisor must extend the schema of the eDirectory tree where you plan to create your GroupWise system. Because all objects for a single GroupWise domain must reside in the same eDirectory tree, installing a basic system (one domain) requires you to extend one tree only. Under Item 5: Tree Name, specify the eDirectory tree where you plan to create the GroupWise objects. You must make sure all users who will use GroupWise exist in eDirectory. GroupWise accounts can only be assigned to eDirectory User objects and GroupWise External Entity objects. GroupWise external entities represent non-eDirectory users and are added to eDirectory for the sole purpose of assigning GroupWise accounts to these users. GroupWise external entities require GroupWise licenses but not eDirectory licenses. You can add GroupWise external entities only after you have installed GroupWise. Instructions for adding GroupWise external entities are provided in Section 8.3.1, Assigning GroupWise Accounts to Users. For a GroupWise system on NetWare or Windows, you need to decide which ConsoleOne location you want use to administer GroupWise. This can be a ConsoleOne location on a network server, or it can be on a local workstation. If you plan to use ConsoleOne on a local workstation, you need to perform the GroupWise installation from that workstation. For your convenience, ConsoleOne is included on the GroupWise 7 Administrator for NetWare/Windows CD. The Installation program lets you install ConsoleOne if necessary. You can also use the Installation program at a later time to install ConsoleOne and the GroupWise Administrator snap-in files to additional locations. IMPORTANT:For a GroupWise system on NetWare, you cannot run ConsoleOne to administer GroupWise at the NetWare server console. The GroupWise Administrator snap-ins to ConsoleOne do not run in that environment. For a GroupWise system on Linux, ConsoleOne must already be installed before you set up your GroupWise system. GroupWise 7 includes eDirectory for Solaris*, Linux, and AIX*, from which you can install ConsoleOne. ConsoleOne is installed to /usr/ConsoleOne. Make sure that ConsoleOne is installed on the Linux server where you plan to create your basic GroupWise system. Under Item 2: ConsoleOne Path, specify the path for the ConsoleOne location you want to use to administer GroupWise. During installation, you are prompted to create a GroupWise software distribution directory on a network server and then copy selected GroupWise software components to the directory. 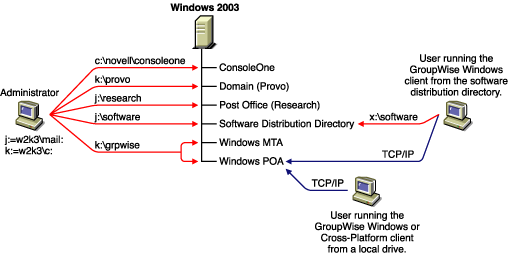 Users can install the GroupWise Windows client through a TCP/IP or mapped connection to the software distribution directory. If you want users to install via a mapped connection, you should create the software distribution directory on a server where you can provide appropriate user access. When users install the GroupWise Windows client, they can choose to copy it to a local drive or they can run it from the software distribution directory. If you want users to be able to run the GroupWise client from the software distribution directory, they must have a permanent drive mapping to the directory. Users can install the GroupWise Cross-Platform client from the GroupWise 7 Client for Linux and Macintosh CD or from the software distribution directory, which requires user access to the file system where the software distribution directory is located. However, Cross-Platform client users cannot run the client from the software distribution directory. They must install it locally. The GroupWise WebAccess client does not require that users install any GroupWise software on their workstations. The disk space required for the directory depends on which software components you copy to the directory. The maximum disk space required to store all the GroupWise software components for one language is approximately 500 MB. For a breakdown by component, see Section 2.0, GroupWise System Requirements. We recommend that you copy at least the GroupWise client files to the directory. This enables users to install the GroupWise client from the distribution directory. Otherwise, you need to mount the GroupWise 7 Client for Windows CD or GroupWise 7 Client for Linux and Macintosh CD as a network volume or file system, or distribute the CD to individual users, unless you use one of the software distribution methods described in Distributing the GroupWise Client in Client in the GroupWise 7 Administration Guide. All GroupWise software other than the client is used for administrative purposes only; if disk space is an issue and you don’t mind accessing the GroupWise 7 Administrator CD for your platform when you need to install one of the software components, you might want to leave the administrative software on the CD. NOTE:On Linux, you might want to install the GroupWise Administration component to your software distribution directory. It includes the RPMs for GroupWise Check (GWCheck) and the GroupWise Database Copy utility (DBCopy). These RPMs are not installed by the GroupWise Installation program. For more information about these utilities, see Standalone Database Maintenance Programs in Databases in the GroupWise 7 Administration Guide. Under Item 3: Software Distribution Directory, specify the path for the software distribution directory. Under Item 4: Select Software, select the software components you want copied to the software distribution directory. The Installation Advisor lets you create one software distribution directory. After you’ve set up your basic GroupWise system, you can create additional software distribution directories if needed. For example, if not all users can access a single software distribution directory to run the GroupWise Windows client Setup program, you can create an additional software distribution directory on a server they can access. For information about creating additional software distribution directories, see Software Directory Management in System in the GroupWise 7 Administration Guide. The GroupWise 7 CDs contain multiple languages. Decide which languages you want to install. Your choice affects the programs listed below. All languages are always automatically installed. You can run any GroupWise program in any available language at any time. For example, if you install English-US and German, you can run GroupWise Administrator and the agents in either language. By default, GroupWise Administrator runs in the language in which you are running ConsoleOne. Your users then have the choice of using either the English-US client or the German client. Under Item 1: Select Languages, specify the languages you want to install for a GroupWise system. The GroupWise Administrator languages are copied to the ConsoleOne location. The GroupWise agent and client languages are copied to the software distribution directory. For more information, see Multilingual GroupWise Systems in System in the GroupWise 7 Administration Guide. The domain functions as the main administration unit for the GroupWise system. When you configure GroupWise information in eDirectory, it is also stored in the GroupWise domain database. From the domain database, the GroupWise agents distribute the information to each post office database. Users then get the information, such as user addresses, from the post office database. In a multiple-post-office system, the domain also organizes post offices into a logical grouping for addressing and routing purposes, and enables you to scale your GroupWise system to meet your current and future needs. As you create your basic GroupWise system, the Setup Advisor prompts you for information about the domain. The following sections prepare you to supply the required information. The domain requires a unique name. The name is used as the Domain object’s name in eDirectory. It is also used for addressing and routing purposes within GroupWise, and can appear in the GroupWise Address Book. The domain name can reflect a location, company name or branch name, or some other element that makes sense for your organization. For example, you might want the domain name to be the location (such as Provo) while the post office name is one of the company’s departments (such as Research). Name your domain carefully. After it is created, the name cannot be changed. You must also provide a name for your GroupWise system. The system name is used when connecting to other GroupWise systems; for this reason, it must be different than any other GroupWise system with which you might want to connect. The system name can be your company name (for example, Novell), GroupWise, or anything else that fits the naming scheme you want to use. The system name is displayed only in ConsoleOne so any characters can be used. You cannot change the name after your system is created. Under Item 6: System Name, specify the system name. Under Item 7: Domain Name, specify the domain name. Security: GroupWise users never need access to the domain directory, so you should create it in a location that you can easily secure. Server Platform and Version: The domain directory can be located on any of the supported platforms listed in Section 2.1, GroupWise Administration Requirements. It can also be located on any platform that an MTA running on a supported platform could access successfully. For example, NetWare 4.2 is not a supported platform for GroupWise 7, but you could put a domain directory on a NetWare 4.2 server because an MTA running on a supported NetWare version would be able to access it there. MTA Access: The MTA requires direct access to the domain directory so that it can write to the domain database. Therefore, you might want to consider the server type (NetWare, Linux, or Windows) and location (local or remote) of the MTA before deciding on a domain directory. For information about the MTA, see Section 3.2.4, Planning Your GroupWise Agents. For examples of possible domain directory locations and MTA configurations, see Sample GroupWise Configurations. IMPORTANT:On Linux, the MTA must be installed on the same server where its directory structure is located. A file system mount between Linux servers does not provide the necessary file locking mechanisms for the GroupWise Linux MTA to write to the domain database on a remote Linux server. Disk Space Requirements: The domain directory requires a minimum of 100-200 MB of disk space for the domain database. In addition, you should plan for an additional 1 GB or more of free disk space for the temporary storage of messages when links are down. Choose the name and path carefully. After the directory is created, it is difficult to rename. If the directory you specify does not exist, it is created during installation. Under Item 8: Domain Directory, specify the full path for the domain directory. You can create the Domain object in any Organization or Organizational Unit container in any context in your eDirectory tree. The only requirement is that it be in the same tree as the other objects associated with the domain (Post Office object, User objects, and so forth). The following sections provide examples of where you might place your Domain object. Because it is helpful to discuss the Domain object’s context in relationship to the Post Office object’s context, the examples also include context information for the Post Office object. 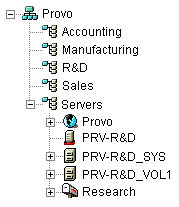 In the following example, the Domain object (Provo) and Post Office object (Research) reside in the same container (Provo) as the organizational units (Accounting, Manufacturing, R&D, and Sales) that contain the users. This allows you to associate the domain with a single organization and associate one post office with all users within the organization. The following example is similar to the previous example, except that a separate post office is created for each organizational unit that contains users. 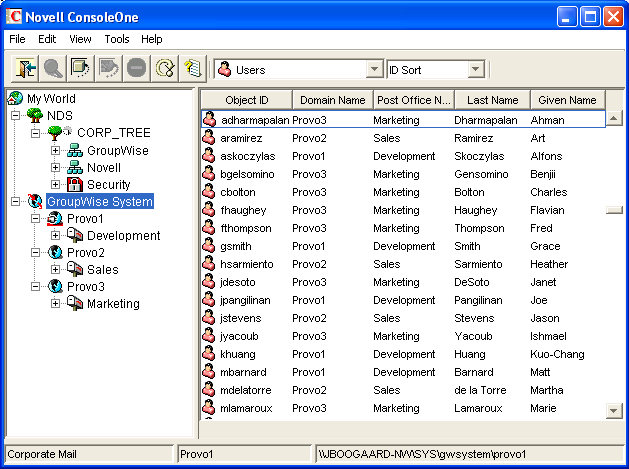 The Domain object (Provo) resides in the organization (Provo) and the Post Office objects reside in the same organizational units (Accounting, Manufacturing, R&D, and Sales) as the users. As in the previous example, this organizational structure allows you to quickly associate users with their post offices. In addition, if you have thousands of users split between the different organizational units, this method allows you to create multiple post offices with a smaller number of users on each post office. Because the domain and post office have directory structures on network servers, you could also choose to place the Domain and Post Office objects in the same context as the servers where the directories will reside, as shown in the following example. If, rather than mirroring your eDirectory or server organization, you prefer to keep all your GroupWise objects together, you could create a container, such as GroupWise, and place all GroupWise objects in that container, as shown below. Administratively, this type of organizational structure makes it easier to restrict a GroupWise administrator’s object and property rights to GroupWise objects only. For information about GroupWise administrator rights, see GroupWise Administrator Rights in Security Administration in the GroupWise 7 Administration Guide. Under Item 9: Domain Context, specify the context where you want to create the Domain object. If the context does not already exist in your eDirectory tree, create the context now. ConsoleOne includes a GroupWise View, displayed under the GroupWise System container. The GroupWise View filters out all non-GroupWise objects and shows how GroupWise objects relate to each other. For example, in the left pane, notice the Post Office object (Development) is subordinate to the Domain object (Provo1). You can select an object in the left pane and display its associated objects (User, Resource, and so forth) in the right pane. The GroupWise View is particularly useful if your GroupWise objects are placed in different contexts in the eDirectory tree. Rather than searching for GroupWise objects throughout the tree, you can administer the objects from the GroupWise View. Some GroupWise administrative functions can only be done while in the GroupWise View. This includes such tasks as defining users from other GroupWise systems so that they appear in your system’s Address Book. The domain language determines the sort order for items in the GroupWise Address Book. Under Item 10: Domain Language, specify the language for the domain. The domain language becomes the default language for the domain’s post offices. Under Item 11: Domain Time Zone, specify the time zone for the domain. The domain time zone becomes the default time zone for the domain’s post offices. The post office contains users’ mailboxes. Like a domain, a post office requires a name, has a directory structure and an eDirectory object, and can be configured to support different languages and time zones. The following sections prepare you to supply the Setup Advisor with the required information. The post office, like the domain, requires a unique name. The name is used as the Post Office object’s name in eDirectory. It is also used for addressing and routing purposes within GroupWise, and can appear in the GroupWise Address Book. The post office name can reflect any element that makes sense for your organization. For example, you might want the domain name to be the location (such as Provo) while the post office name is one of the company’s departments (such as Research). Name your post office carefully. After it is created, the name cannot be changed. Post office names must be a single string. The same characters that are invalid in domain names are also invalid in post office names (see System and Domain Names). Under Item 12: Post Office Name, specify the name you’ve selected. Security: The GroupWise Windows and Cross-Platform clients access the post office through a client/server (TCP/IP) connection to the Post Office Agent (POA). The WebAccess client uses an HTTP connection. Therefore, GroupWise users never need access to the post office directory, so you should create the directory in a location that you can easily secure. Server Platform and Version: The post office directory can be located on any of the supported platforms listed in Section 2.1, GroupWise Administration Requirements. It can also be located on any platform that a POA running on a supported platform could access successfully. For example, NetWare 4.2 is not a supported platform for GroupWise 7, but you could put a post office directory on a NetWare 4.2 server because a POA running on a supported NetWare version would be able to access it there. POA Access: The POA requires direct access to the post office directory so that it can write to the post office database. Therefore, you might want to consider the server type (NetWare, Linux, or Windows) and location (local or remote) of the POA before deciding on a post office directory. For information about the POA, see Section 3.2.4, Planning Your GroupWise Agents. For examples of possible post office directory locations and POA configurations, see Section 3.2.5, Sample GroupWise Configurations. IMPORTANT:On Linux, the POA must be installed on the same server where its directory structure is located. A file system mount between Linux servers does not provide the necessary file locking mechanisms for the GroupWise Linux POA to write to the post office database on a remote Linux server. Disk Space Requirements: The post office directory holds users’ messages and attachments, so you should plan a minimum of 5 MB per user. 100 MB or more per user is recommended. Although actual messages are relatively small, message attachments (documents, spreadsheets, images, and so forth) can greatly increase the amount of disk space used. Using ConsoleOne, you can restrict the amount of disk space users are allowed for their mailboxes. When you know the number of users and the amount of disk space allocated to each user, you can more accurately determine the amount of disk space required for the post office. You can reduce the amount of disk space required for the post office by forcing users to run the GroupWise Windows and Cross-Platform clients in Caching mode rather than Online mode. In Online mode, messages are stored only in the post office. In Caching mode, messages are also stored on users’ local drives, so you can reduce the size of users’ Online mailboxes independent of what users want to store in personal locations. In addition to user messages and attachments, the post office directory also contains a document library. If you want to use GroupWise document management, you should take into account the disk space you want to provide for storing documents. Plan for 100-300 MB for the post office database, which holds the GroupWise Address Book and updates to it for download by Remote client users. Also plan 500 MB or more for the temporary storage of messages when links are down. Under Item 13: Post Office Directory, specify the full path for the post office directory. Like the Domain object, you can create the Post Office object in any Organization or Organizational Unit container in any context in your eDirectory tree. The only requirement is that it be in the same tree as the Domain object and other objects associated with the domain (User objects and so on). For configuration examples, see Domain Context. Under Item 14: Post Office Context, specify the context where you want to create the Post Office object. If the context does not already exist in your eDirectory tree, create the context now. The post office assumes the same language as its domain unless you specify otherwise. For example, if you set the domain and post office language to English-US, the Address Book items are sorted according to English-US sort order rules. This is true even if some users in the post office are running non-English-US GroupWise clients such as German or Japanese. Their client interface and Help files are in German or Japanese, but the sort order is according to English-US standards. Time, date, and number formats for the non-English clients default to the workstation language. Under Item 15: Post Office Language, specify the language for the post office. The post office assumes the same time zone as its domain unless you specify otherwise. Under Item 16: Post Office Time Zone, specify the time zone where the post office is located. You need to assign a GroupWise account to each eDirectory user who should have a mailbox in the post office. You can do this while creating your system, or you can do it afterwards. However, we recommend that you at least add yourself as a GroupWise user so you can test the system. If desired, specify the context for each user under Item 20: Post Office Users. The Setup Advisor lets you select users from the eDirectory tree to add to the post office. You do not need to list all of the users at this time. If you are adding non-eDirectory users as GroupWise external entities, you must wait to add them to the post office until after you have finished the installation. Instructions for adding GroupWise external entities are provided in Section 8.3.1, Assigning GroupWise Accounts to Users. The Message Transfer Agent (MTA) and Post Office Agent (POA) route messages through the GroupWise system. 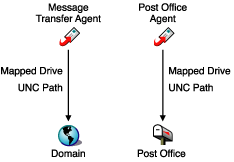 The MTA handles all message traffic between the domain and post office, while the POA handles all message traffic within the post office. MTA: GroupWise requires one MTA per domain, which means that you need to install and run one MTA for your basic GroupWise system. POA: GroupWise requires one POA per post office, which means that you need to install and run one POA for your basic GroupWise system. The POA routes messages within the post office, updates the post office database when it receives administration messages from the MTA, and performs other maintenance tasks in the post office. The MTA and POA are available as NetWare NLM™ programs, Linux executables, and Windows executables. In general, GroupWise is most efficient if you match the agent platform with the network operating system where the post office and domain are located. For example, if a domain and post office are located on a NetWare server, then you would install the NetWare agents for them. However, this is not required. For configuration examples, see Section 3.2.5, Sample GroupWise Configurations. Under Item 21: Agent Platform, specify the type of agents (NetWare, Linux, or Windows) you want to use. The MTA requires direct access to the domain directory so that it can write to the domain database. The POA requires direct access to the post office directory so that it can write to the post office database. In general, we recommend that you install an agent on the same server as its directory. For example, you would install the MTA on the same server as the domain directory and the POA on the same server as the post office directory. This ensures that the agent always has access to its directory. For the purpose of simplifying the setup of your basic system, you are required to install both the MTA and the POA to the same server. If, at a later time, you decide that you want to run one of the agents on a different server, see Section 7.0, Installing GroupWise Agents. When installing the NetWare agents, we recommend you use the sys:\system directory on the NetWare server. This simplifies the use of startup files and ensures that the agent NLM programs are in the server’s search path. If you use a different directory, you must add that directory to the server’s search path. The Linux agents are automatically installed to /opt/novell/groupwise/agents. On Linux, do not move the agent software to a different location. The default installation directory is c:\grpwise. However, you can install the agents to any directory you want. Under Item 22: Installation Path, specify the installation path for the agents. In general, a TCP/IP connection between the MTA and the POA is preferable. Under Item 17: Post Office Link, select whether the MTA will connect to the post office through a TCP/IP link to the POA or a direct link to the post office directory. Under Item 18: POA Network Address, specify the IP address or DNS hostname of the POA’s server. The GroupWise Windows and Cross-Platform clients, which access the POA through TCP/IP, need to know the address. If the MTA will have a TCP/IP connection to the POA, it will also use this address. If you plan to have the MTA use a TCP/IP connection to the POA, under Item 19: MTA Network Address, specify the IP address or DNS hostname of the MTA’s server. The MTA and POA provide server consoles to let you monitor and configure the agents while at the agents’ servers. The MTA and POA consoles are always displayed. The MTA and POA consoles are displayed only if you start the agents with the --show switch on the command line. The MTA and POA consoles are displayed if you run the agents as applications but are not displayed if you run the agents as services. When the MTA and POA consoles are not available, you can monitor and configure the agents through a Web browser. This feature, referred to as the agent Web console, lets you access the agents’ statistics and diagnostic information from any location where you are connected to the Internet and have access to a Web browser, either at a workstation or on a mobile device. where mta_network_address and poa_network_address are the agents’ IP addresses or host names and port is the agent’s HTTP port number. Under Item 18: POA Network Address, specify the POA’s HTTP port. The default port, 7181, should be used unless there is a port conflict. Under Item 19: MTA Network Address, specify the MTA’s HTTP port. The default port, 7180, should be used unless there is a port conflict. If you have users with various language preferences, you can install the GroupWise agents in multiple languages. The language determines the agents’ interface language only. It does not affect messages processed by the agents. By default, the agents start in the language selected for the domain. If that language has not been installed, the agents start in the language used by the operating system. If that language has not been installed, the agents start in English-US. Under Item 24: Language, list the languages you want to install for the agents. When the domain and post office directories are located on the same server where you are installing the agents, the agents can run under the local system account. You can also display the agent server console when the agent software, directories, and databases are local. When the domain and post office directories are located on a remote server, you must specify a user with rights to access the domain and post office directories. If the Windows agents need to log in to another Windows server, provide a Windows username and password. If the Windows agents need to log in to a NetWare server, provide an existing eDirectory username and password, or create a new account for the agents, as described in Creating a NetWare Account for Agent Access (Optional). Configuring the Windows agents to log in to a Linux server is not recommended. As with all Windows services, you can start the agents manually or have them start automatically each time the Windows server restarts. Under Item 23: Windows Installation Options, select Install as Windows Services if you want to run the agents as Windows services. If you want to run the agents as Windows services, under Item 25: Windows Services Information, record the account the agents will run under, and if necessary, the password for the account. Also select whether you want the service to start automatically or manually. Many different configurations are possible for your GroupWise system. The following diagrams illustrate some of the ways a basic GroupWise system (one domain and one post office) can be set up. The following diagram shows a basic GroupWise system set up on a single NetWare 6.x server. The following diagram shows all GroupWise components on a Linux server. The following diagram shows all GroupWise components on a Windows 2003 server. The following diagram shows the domain, post office, and software distribution directory on a server running the NetWare version of Novell Open Enterprise Server (OES). The MTA and POA, located on a Windows 2003 server, use a UNC path to access the domain directory and post office directory on the OES NetWare server. The following diagram shows the domain and MTA on a NetWare 6 server. The post office, software distribution directory, and POA are on a Windows 2000 server. The MTA communicates with the POA through TCP/IP. NOTE:The above configuration has the MTA on one server and the POA on another. Because the basic GroupWise system setup requires you to install the MTA and POA on the same server, you would need to do additional setup to create a similar configuration.